This delicious casserole was inspired by Mr Slater Senior who used to cook a similar version every Christmas. 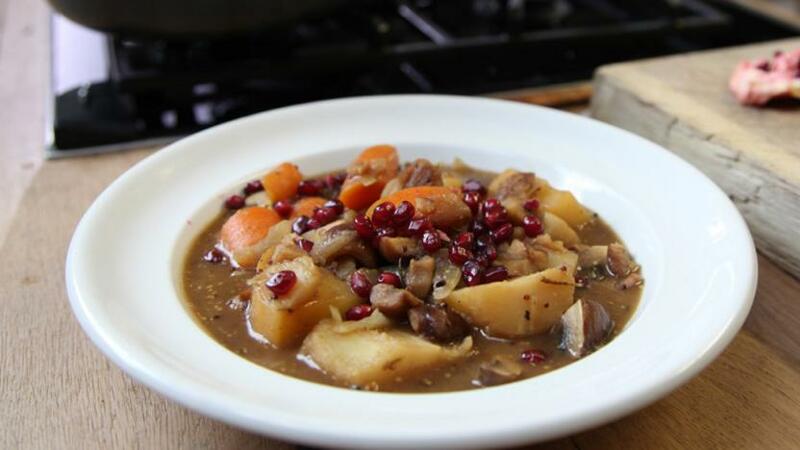 This one’s full of winter veg and mushrooms, but it’s equally as tasty with a few bits of turkey or ham thrown in too. Each serving provides 268kcal, 6g protein, 38g carbohydrate (of which 18g sugars), 7g fat (of which 3g saturates), 10g fibre and 1.2g salt. Roughly chop the onions and slowly soften in a casserole with a little butter. Meanwhile pick a sprig of rosemary into a mortar and pestle with a pinch of salt and the juniper berries. Give them a good bashing then add to the onions. Now chop the carrot, swede and parsnip into hearty sized chunks, they are going to be the body of the stew, and add to the onions. To build the sauce, tip in a few glugs of whatever Christmas wines you have to hand, here I particularly like Marsala. Add a spoonful of flour and stir in allowing it to cook through and thicken the sauce. Add the chestnuts, bay leaf and stock, season with freshly ground black pepper, then leave to simmer for 15 minutes. Quarter the chestnut mushrooms; then add them to the pot along with a handful of dried porcini. This will give the stew a woody depth. Now for the finishing touches to the sauce add a spoonful of wholegrain mustard and redcurrant jelly, and let simmer for a further 20 minutes. Finally serve with a scattering of pomegranate seeds over each helping.